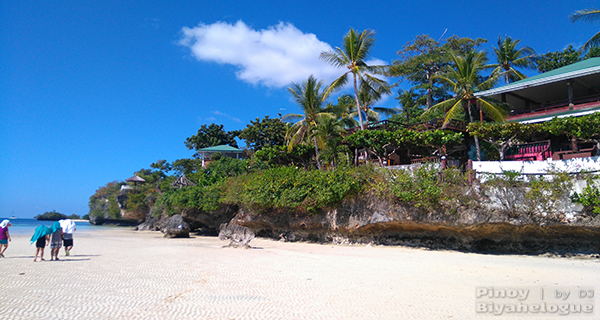 It is comparable to the renowned island of Boracay for its powdery white sand beaches. That is how a local from Cebu City described Camotes group of islands. I have not yet been to Boracay but per her description, the most popular destination in Camotes may attest to that characteristic. Santiago White Beach is a long stretch of white sandy beach along the coast of Santiago Bay which is under the municipality of San Francisco or Sanfran as locals call the sole town of Pacijan Island. It is a public plaza maintained by the local government where everyone can frolic during their free time, free of any fees. 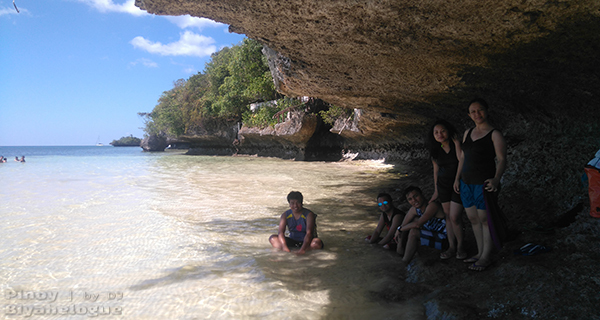 We visited Camotes Islands without an itinerary, thus the owner of the resort we stayed in brought us to the islands' interesting places on his own phase. He toured us around the connected islands of Pacijan and Poro for a day via the resort's shuttle and let us spend another day in Santiago White Beach. A day was just enough as we did not run out of activities during our stay. Laid-back travelers would be delighted by the view of the beach and the sea horizon as it kisses the clear sky. Some tourists savor the pristine beach while they sunbathe on the sandbars visible when the sea is at low tide. 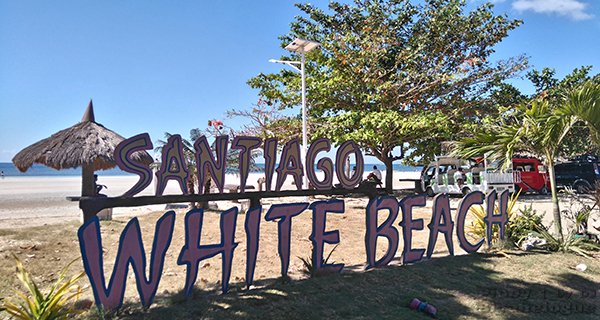 Santiago White Beach boasts not only its "milky polvoron-ic" sands. Enticing rock formations on the farther side of the shoreline is a sight to behold and a great area to enjoy the beach. Water was shallow and sands along the rocks were visible as the sea is at low tide. It was a searing noontime when we gave in to the sea's charm but tide marks upon the rocks provided a shade from the sun's scorching heat. Adventurous travelers may find it monotonous to just sit back or lay down by the beach all day. Some sorts of water sports and activities in Santiago beach may quench this thirst for adventure. Jet skis, kayaks and other water rides were available at the establishments on the beach. 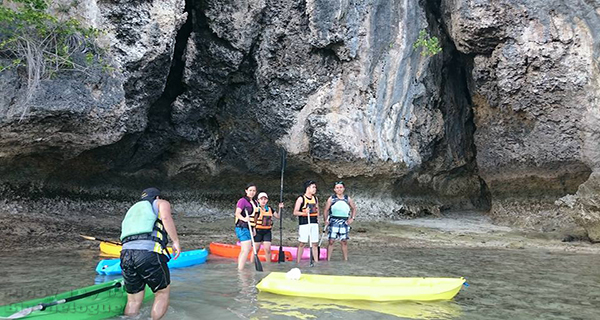 We kayaked around until we reached a secluded part of the island. It was fun to go kayaking for the first time despite getting my skin sun-kissed and my biceps pumped up, how I wish, after an hour of rowing. Kayaking for an hour cost us PHP 150 per kayak. Not just the Santiago Bay but the Camotes Islands as a whole is perfect for snorkeling and scuba diving enthusiasts. 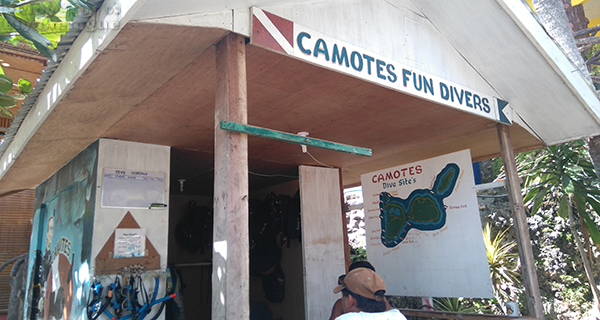 Its underwater marvel may be affirmed by a map posted at the Camotes Fun Divers' station showing numerous diving spots surrounding the islands. I hate to pass up but I am neither a licensed diver nor even an experienced swimmer to take this activity. Cost of scuba diving starts at PHP 1500. 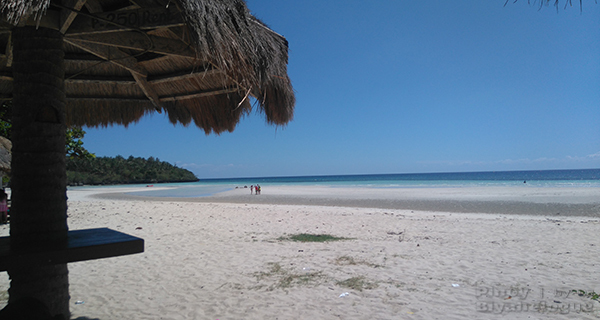 Santiago beach also gave us a taste of the Camotes Islands. 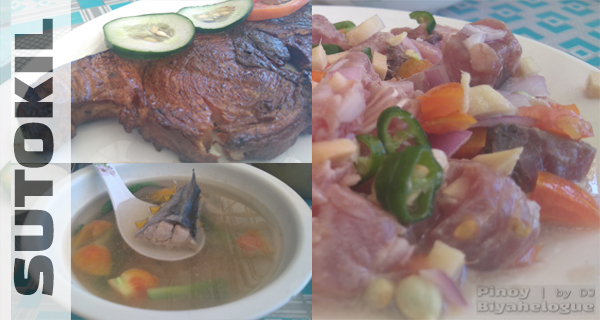 Pito's Sutokil, a restaurant along the beach, serves one of Cebu's popular delicacies. Sutokil is a seafood fusion delicacy which is a combination of dishes prepared in three different types of cooking. Sutokil is an acronym. SU stands for sugba, TO for towa and KIL for kilawin. Sugba is a Cebuano term for inihaw, or grilled dishes. I was about to believe that grilled delicacy is a Cebuano favorite as different grilled dishes can be snacked on even in the city. Towa on the other hand is a term for soup dishes, a steaming dish perfect for a yearning tummy. A regional favorite, kilawin, is a Filipino dish similar to ceviche. Made from raw fish cured in spiced vinegar, it is a perfect pair for an ice cold beer. Each dish costs around PHP 100 and can be ordered separately. 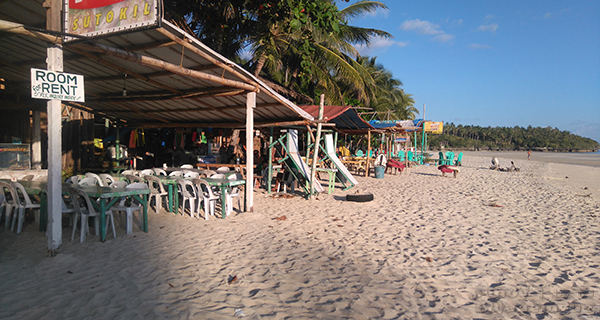 Private resorts and the small diners lining the beach offers room accommodation for travelers opting to stay in Santiago White Beach for their entire Camotes Island getaway. Rooms offered by small diners are a better option for those who travel on a shoestring budget. Aside from rooms, foods and refreshments, souvenir items are also sold by these diners. We found no other place on the island selling souvenir items other than Santiago White Beach. 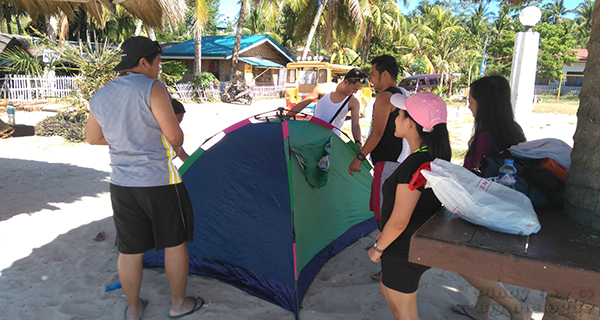 Since we would be staying on the beach for just a day, we only rented and pitched a tent under a shady area where we could left our belongings while relishing the beach. Tent rental was PHP 350 for a day while hut cottages that comes with wooden sunbathing benches could be rented out for PHP 250. Camping overnight could also be a great idea. I was not sure though if putting a bonfire was allowed. Still having more time before calling it a day, we sat down at the same diner where we chartered our tent and sang our hearts out with their videoke machine. 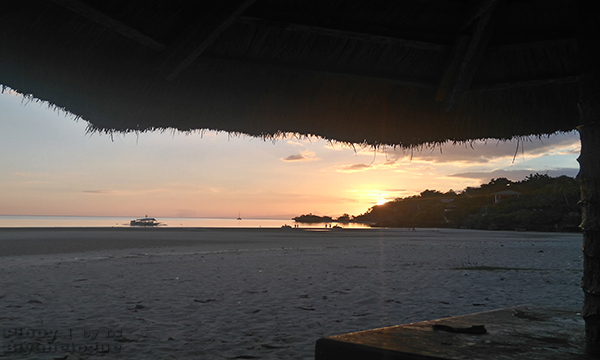 For PHP 5 a song and a bottle of beer, the serenity of Santiago beach has been disrupted for a while. Other diner had their videoke machine hired at PHP 100 per hour. However, using videoke machines are allowed until 2 AM only. Thank goodness. 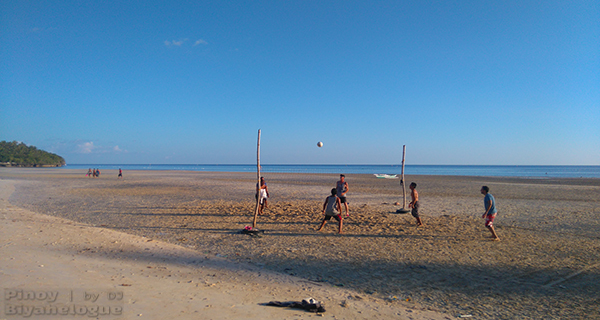 Travelers who would feel a little sporty may rent a ball and get sweaty at the beach volleyball area or in the basketball court located near the barangay hall. These are some of the fun activities to do while waiting for the sun to set. And speaking of sunset, we concluded the day in Santiago White Beach by delighting ourselves with the sun as it sets behind the horizon. A day on the beach would not be complete without catching the sunset anyway. Let's call it a day, Santiago Bay. Photographs speak a thousand words, they say. 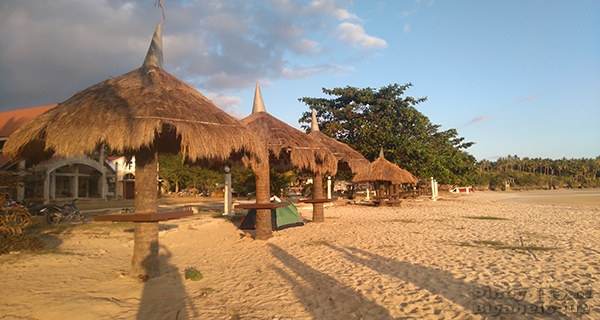 So please let these photos tell you more of this beautiful beach in the northern part of Cebu. Wow. Thanks for dropping by rahul sr. Your comment means a lot. Come and visit the Philippines soon.